Do you wish your app to stand out on Google Play Search and App Store? Are you worried that your app is not getting enough downloads? In that case, there is only one solution - app store optimization. Research by Forrester suggests that 63% apps are discovered on app stores by way of general browsing. 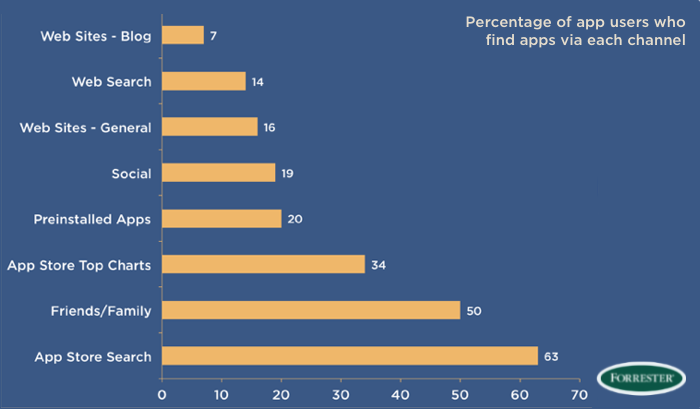 Thus, it can be concluded that app stores are the most used places for downloading new apps. Since, you are in competition with thousands of other apps in the similar domain, being recognized is possible only through optimization of the app. ASO provides you with the tools and techniques so that the end-users can discover, install and engage with your product. With this unique procedure, you can be rest assured to get a new set of users, who will use your app and become loyal to your product, to the point of suggesting others use it too. App Store Optimization is the method by which you can make sure that everyone can find and access your app on the Google Play Store and other app stores. The higher your app ranks for relevant searches, in the search results, the greater are the chances of visibility to your potential customers. How does ASO Rank Apps?